HIT: To the first Three Rivers Little League team to win the state championships and move on to the regional level. The junior girls softball team is dominated by eight Gypsum girls, which bodes pretty well for Eagle Valley High School’s softball team’s future. 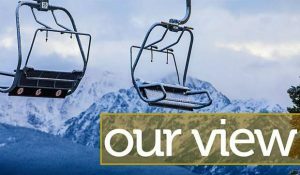 MISS: To the new ban on plastic grocery bags in Vail. Seems that ought to remain a decision between the grocers and their customers rather than a municipal nanny. Awfully selective legislation there for ambiguous impact on the environment compared to perhaps some other steps the town within its scope could take that might make more of a difference to the environment, if inconvenient to the more luxurious of tastes. Heating village sidewalks and streets comes to mind. HIT: To a governmental decision that is consequential in taking practical measures to limit the damage of carbon releases when we can do better or at least recognize the uncounted expense fossil-powered power plants are running up: the Environmental Protection Agency’s Clean Power Plan. We can and should implement it. HIT: To upgrading Chair 2, the Avanti lift, on Vail Mountain. Communities with Vail Resorts-run ski hills are becoming quite spoiled with the pace of on-mountain improvements. MISS: On principle to the federal government paying subsidies to local governments just because public land overlays their boundaries. While it’s nice to have payments in lieu of property taxes for public land, which takes up 85 percent of Eagle County, it’s not like the county or local governments are providing much in the way of services to the land. Maybe the money should go instead to the Forest Service and Bureau of Land Management — so that they can. Those agencies need the money more than the comparatively wealthier municipalities do. HIT: To the Betty Ford Alpine Gardens fulfilling a dream with its new education center and offices. Considering the fuss when this was planned for the site of the old schoolhouse, nice to see that win-win result work out. HIT: To the Young Composers program, a partnership between the Vail Valley Foundation and New York Philharmonic to work with children composing original music. How cool is that for a kid? HIT: To a continuing trend of improvement in the tourism business, which in summer seems to have a ton of growth potential. This is funny in that you don’t have to scratch a local very deeply to gain admission this is the favorite season for most. HIT: To early interest in presidential candidates, mainly because the Republicans have so many of them. So many, they’re complaining about Fox News’ decision to limit tonight’s debate to the most popular 10. Candidates outside the circle are even complaining about “the media” — music to Fox ears. HIT: To the Salvation Army and its Empty Bowls fundraiser on Friday at Battle Mountain High School. You can help a good cause and take home a bowl, too. HIT: To solar panels on a bus barn, this one in Leadville. This will make five buildings where Eagle County has put up solar panels. Here’s a vote for another on the big ol’ roof of the bus barn in Avon. HIT: To a good summer in the valley, even if cooler and wetter than most recent years. Maybe because of that.